It is no secret that the Kardashians are famous for simply that, being famous. But how did they rise from a reality TV show to American Royalty in just 7 years? Branding. Not only do they have their own personal clothing, cosmetic, and housewares lines but they also use social media to promote everything else they do. 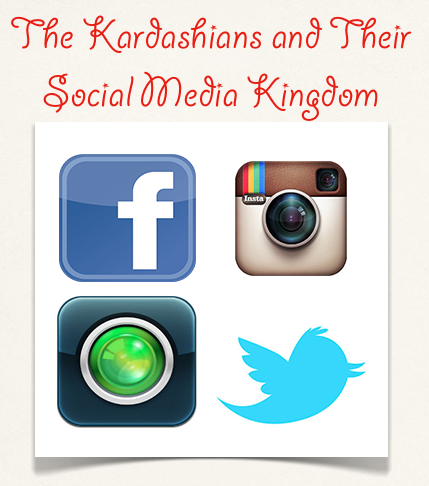 From Instagram to Keek, the Kardashians have taken over the social media world one tweet at a time. And with Kim’s upcoming child from her beau Kanye West, another branding mogul will be born. It wouldn’t be surprising if the new Kardashian-West got their own twitter account to track how many bottles they’ve consumed in a day. Okay, so maybe the pictures of the Kardashians in bikinis and holding $10,000 Hermes handbags are part of what bring them followers. However, they don’t just post about anything and everything. They post about things that are true to who they are and their brand. 1. Is this post representing my business well? 2. What popular hashtags are applicable to this post? 3. Am I linking followers back to my company’s website? Everyone including Kim Kardashian’s cat, Mercy, knows how to use Facebook. Facebook is a great way to link people back to your website. Glam up your Facebook page and fill it with new and exciting information. Unlike other social media outlets, Facebook gives followers the opportunity to really learn about your business and website. Make sure to include valid information in your “about” section and stay on top of Facebook posts. To gain more Facebook traffic, advertise free giveaways to followers of your Facebook page. Being cheap never got the Kardashian sisters anywhere. They are always using Facebook to offer followers and fans free merchandise. After all, nobody can resist some free swag. Twitter is the Kardashians favorite social media tool, and rightfully so. With the ability to reach across your fan-base in just seconds, you can send a tweet anywhere. Even when they are across the world, the Kardashians are still tweeting and maintaining a relationship with their Twitter followers. Delegate a good 10 to 15 minutes to Twitter a day. Maybe even two minutes every hour to send a quick tweet out into the Twitter-sphere. By demonstrating an on going presence people will link back to you. Worse comes to worse, hashtag #kardashian. That should bring you a few new followers. With over 6 million followers on Instagram, it is no secret that Kim Kardashian uses Instagram for just about everything. Instagram is a way to connect to fans, the world, and other businesses strictly through the means of photography. Although they Instagram pictures of nothing less than their fabulous lifestyle, the Kardashians are constantly promoting their brands. By snapping quick pics of your businesses leading product, followers can have access to your business and personal life. Much like with Twitter, Instagram utilizes hashtags to attract more users back to your Instagram page. Use at least one hashtag with every picture you post, in order to link people back to you and attract more followers. Start by taking pictures that are of your niche. Advertise new products, new employees, or screen shots of new posts on your blog. Keek is the newest addition to the social media family. Kylie and Kendall Jenner were the first in the Kardashian clan to start utilizing Keek. Keek acts similar to Instagram except you can post small videos instead of pictures. Because Keek is newer to the social media world, start getting people excited about this new tool! Last but not least, always promote your social media pages on your website, business cards, and anywhere in your office. Encourage people to like your Facebook page and follow you on other social media tools. Theo Schmidt has worked as a software engineer in Los Angeles since graduating from UCLA in 2006 with a degree in computer science. He spent five summers working for an SEO Calgary company, where he developed a love for social media. He enjoys spending time in the outdoors and is an environmental activist. Absolutely indeed, I’ve created my Instagram account a year ago, but I already have more than thousand followers, and these have the similar interests like me. I get usually at least 200 likes for every posted picture, and I can see it in my stats that I get some worthy clicks every single day. I don’t spam others or use a bot or an automated like-robot, I just like spend some time tapping pictures I like and following inspirational people. And of course, I try to post regularly valuable content. That is really important.